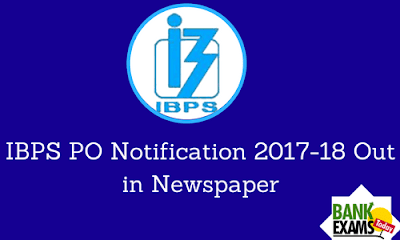 The most awaited notification of the year, the IBPS PO 2017-18 has been released in a newspaper and we are here with the details of the notification. 20- 30 years as on 01.07.2017. IBPS PO Exam is divided into three phases that we all know and the details of the phases are given below. The exam pattern is mentioned in the table below. You will get 100 questions to be solved in 60 minutes and there is a provision of -0.25 negative marking. Student who will clear the Premlims exam will appear for the mains exam and there will be 5 section and time-duration for each section will be specific which is mentioned in the table below. Students msut attempt the exam in the same order and the allotted time as mandated at the time of the exam. The candidate can’t skip to the next section before the time allotted to the current section has elapsed. Again, there is negative marking 0.25 marks for each incorrect answer. The candidates who have qualified the mains exam are called for the interview which carries a maximum of 100 marks. The minimum qualifying marks in the interview is 40% (35% for SC/ST/OBC/PWD candidates). The final merit list is prepared on the basis of marks obtained in mains examination and interview. The final scoreis calculated with weightage of marks given to the main examination and interviewin the ratio of 80:20 respectively. Note: This notification is based on the advertisement published in the newspaper. 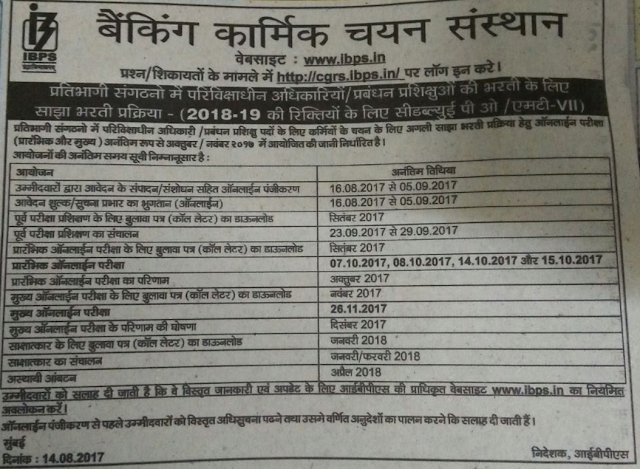 Candidates are advised to check the official website of IBPS regularly to get the official notification which is likely to be released before the end of this month.